HYIPLister Surf is a package for HYIP listings and monitoring sites. Thissoftware helps you to create and manage your own HYIP Listing site withease. The combination of price, features, performance and security arethe best on the current market. HYIP/autosurf listing rating andmonitoring system. 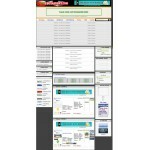 Has an automated banner and text ads purchase systemand also a New listing addition automated process. Visitors can easilypurchase a rotating/non rotatng banner ads, text ads. Improved design.non encoded .Automated, decoded, TESTED. After purchase support guarantee. This Script Receive Payment With E-Gold, LibertyReserve, E-Bullion,V-Money, PCUNIX. This Script support Liberty Reserve, E-gold & E-Bullion e-currency payment Automatic Add Listing, so Listing will be Added Automatic after payment use Liberty Reserve / E-Gold / E-Bullion Done.